300 pc. 500 pc. 650 pc. We carry sets of 300, 500, or 650 pc. Professional Quality 39mm 11.5 Gram Clay Composite poker chip sets. Just like the poker chips used in Las Vegas. Our poker chips are made from high quality composite resin with a metal insert to add weight which gives our chips a heavy professional feel. These are the finest clay composite chips available. With these chips, you will feel like a pro at your next poker party. 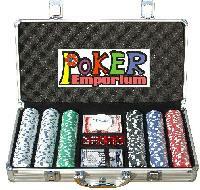 Using these chips on poker tables, club tables, or the kitchen table, you will feel like a professional poker player. These chip sets will last forever and can be handed down to your children. We use double wall cartons with Styrofoam corners to assure your Poker Chip Set arrives in PERFECT Condition. 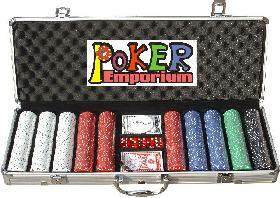 Looking for other poker accessories? 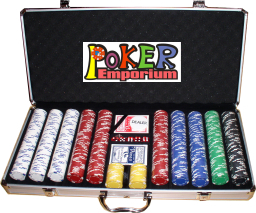 Individual Poker Chips, Poker Tables, Poker Chip Cases, Cards, Dice and other poker accessories can be found on our accessories page.